It's the question. The question on every dive. You know that you've asked yourself, your dive master, and other divers this very questions. What kind of fish is this? Don't know? Don't be THAT diver! We still have spots open in our upcoming Fish ID class! Join UADC's favorite fish nerd, Instructor Neil DeMaster as he takes you through the basics of how to identify the fish you see. You'll learn how the shape and size of fish, along with color, helps you to identify our underwater friends. You'll also learn how to prepare to identify fish based on where you'll be diving. This great class will set you up to know exactly what you're seeing underwater! Join us on Wednesday, 9 May 2018 from 6:00-9:00 p.m. (P.S. 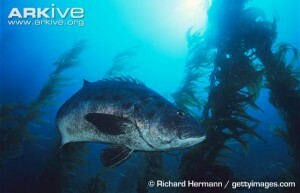 : this is a black sea bass, which is critically endangered. Interestingly, divers often try to identify fish by color. As the black sea bass shows, that's a mistake: "Juveniles start out life as a bright orange colour with black spots, with the orange turning a more bronzy purple as the individual grows and the spots fading as the fish gets darker. Large adults often appear solid black to grey, with a white underside, but retain the ability to display large black spots. Indeed, black sea bass are in fact capable of rapid and dramatic colour changes, from dark above and light below to displaying white mottling or simply changing from jet black to pale grey. These colour changes are thought to act as a form of communication between individuals or to be an indication of stress." You can learn more about black sea bass at Arkive (https://www.arkive.org/black-sea-bass/stereolepis-gigas/image-G18633.html).